And happy birthday to one of my dearest and absolutely funniest friend, Pammy. We go back a while and we know each other's secrets, so we have to stay friends forever. I wanted to showcase one of the beautiful new colors at Gina K. Designs. This blue is called Blue Lagoon. 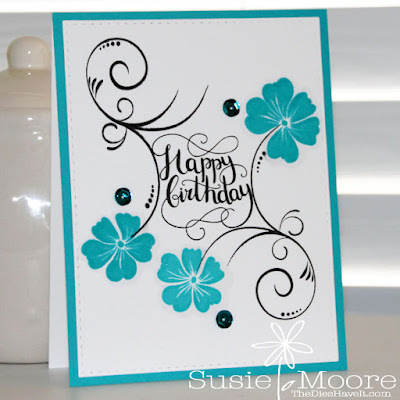 I double stamped two of the flowers to make the deep rich color you see. On my third flower, I stamped one time. This is fast becoming a favorite color for me! The stamps and card stock I used are part of the new StampTV Kit called Made With Love. Be sure to check it out because once you see it, you'll know you need it!! Happy Birthday Pammy! Have a great day everyone and I'll see you tomorrow.